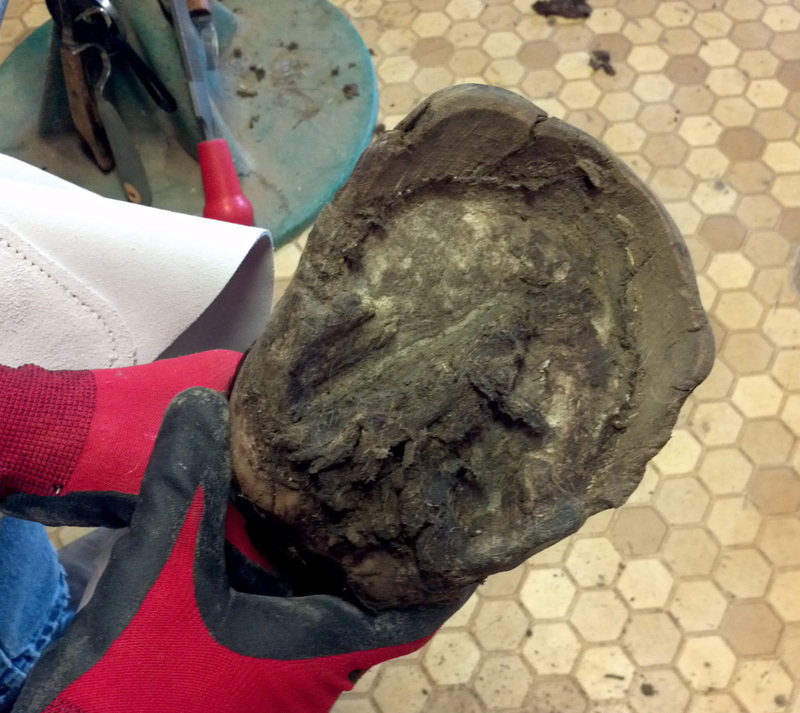 Not just a hoof clinic…. 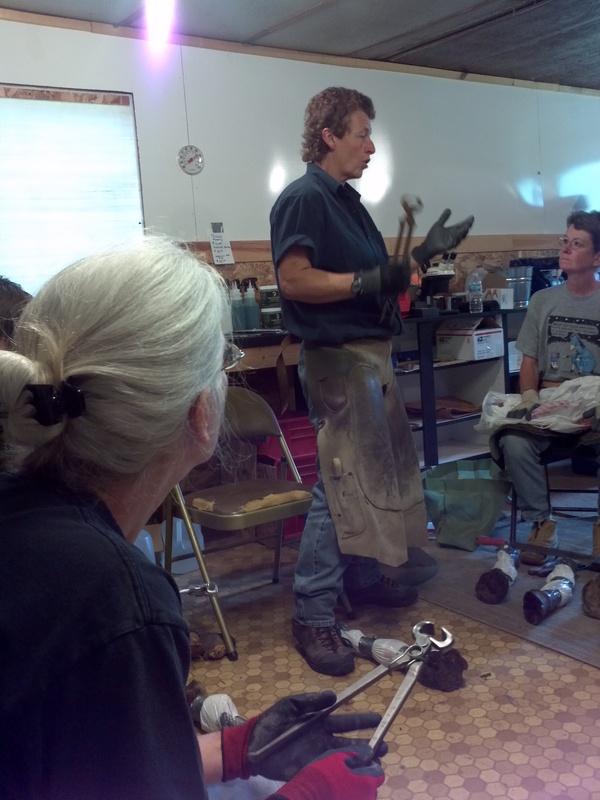 Yesterday I had the great good fortune to attend a beginner hoof trimming clinic with Ida Hammer at her place in central Illinois. I don’ t want to become a trimmer (certainly not starting out at 60+! ), but I do want to know everything I can about my horses’ feet and the care they need. So a friend and I made the 4-hour trip. The clinic was amazing, and not just because of the information. It was such an experience, on so many levels! I had been afraid that it would smell bad and I’d be uncomfortable. 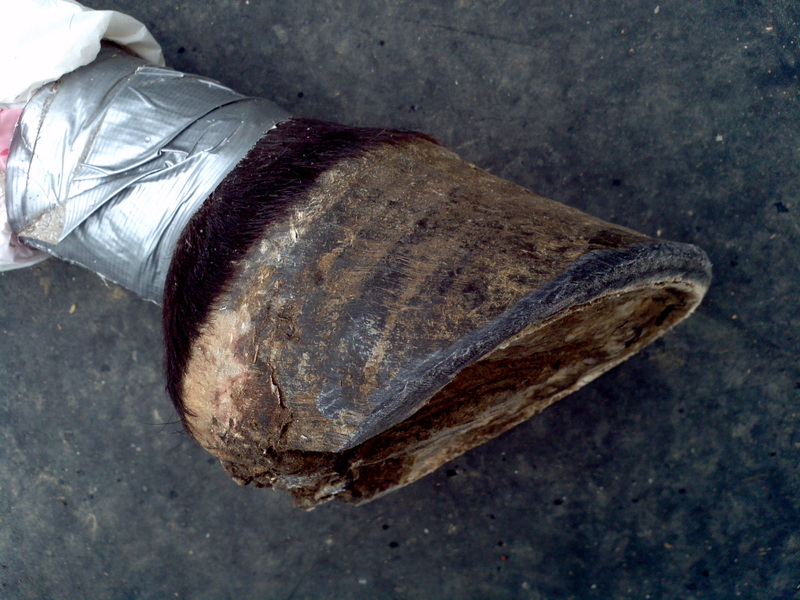 Well, it didn’t exactly smell great, but there was no smell of death—the legs were fresh-frozen and then thawed, carefully wrapped with plastic and duct tape to expose only the fetlock and hoof. Those were some gnarly, smelly feet, I’ll grant you. Hooves of all shapes and sizes, in pretty bad condition. The sheer amount of information that was shared was astonishing and overwhelming at times. Ida’s knowledge is deep and broad, and her enthusiasm and love for the horse is huge. The most important thing I learned was how much I still have to learn—a lifetime isn’t enough! What was most interesting of all, though, was the “relationship”that I developed over the course of the day with the big horse whose foot I trimmed. There’s no explaining it in logical terms, other than to say it was my imagination running away with me—but I know that wasn’t the case. From the moment I first picked it up, that leg felt alive to me, not in a physical way, but energetically, psychically. That horse was PRESENT. His energy was big, warm, curious, friendly, happy. He was not in the least distressed by what was going on. As the day went on and the trim proceeded, I found myself talking to him, patting him, reassuring him, like I would have done to a living horse. I was careful to put the leg down gently, and to protect it from people walking past. Doing a good job with the trim was important to me so he could walk properly and freely—even though this leg, obviously, would never again feel the ground in a joyful gallop. No matter. Call me crazy, but that experience was as intimate as anything I’ve had with my own living, breathing horses. By the time I had that hoof trimmed up and looking great, I felt like he was “my” horse—felt so much affection for him and happiness in his presence! The thought of him running across those heavenly pastures with beautiful, sound feet was a joy. When it was over and Ida asked who was going to take their leg home, I wanted to raise my hand. But we were several hours from home without a way to keep it chilled overnight and on the trip back. What, you ask, would I have done with an amputated horse leg? Buried it in our little pet graveyard out in back of the house, with Shadow and Oshie and Wendy the Dog—those other four-legged family members who’ve gone on ahead. But instead, I’ll write, and honor his memory and his sacrifice this way. I wasn’t the only one to sense the presence of the horses yesterday. My friend, auditing, says she could feel the entire “herd” there with us, happily grazing and watching us as we learned from their feet and legs, just hanging out with us. Horses, in life and death, are amazing creatures. Last night, lying in bed at the hotel, I missed my new-found friend and grieved his passing as if I had known him a long time. Those tears felt right and just. This morning, the intensity of the sadness has moved on and I’ve gone “back to grazing.” His memory, and my gratitude, remain. Many thanks, my four-legged friend! And if you didn’t know love and care in your lifetime, I hope you could feel it yesterday. Godspeed! ← What is leadership, really?